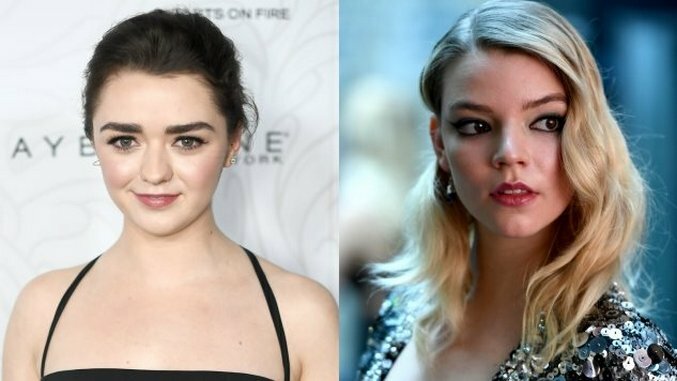 After over a year of rumors, Fox finally confirmed that Maisie Williams and Anya Taylor-Joy will star in next year’s X-Men spinoff, New Mutants. Validating the long-swirling whispers, THR reported yesterday that Williams (Game of Thrones) is set to play Wolfsbane, “a girl struggling to reconcile her religious beliefs with her power to turn into a wolf,” while Taylor-Joy (Split, The Witch) will star as Magik, ”a girl who has learned sorcery and uses teleportation discs to travel.” Magik is better known by some as the sister of mutant Colossus, who saw more screen time than ever in last year’s Deadpool. Josh Boone (The Fault in Our Stars) is still on board to direct the script he co-wrote with Knate Lee. Next to be cast will be the actors playing the also-confirmed Moonstar, Sunspot, Cannonball and Warlock. The studio is said to be “making serious efforts to find ethnically appropriate actors,” with the casting searches for Moonstar and Sunspot to be focusing on Native American and Brazilian actors, respectively. The movie, which will begin production this July, is the first of three X-Men films scheduled for next year. Boone’s picture is to be followed by June’s Deadpool 2 and November’s Dark Phoenix. As of now, New Mutants is scheduled to hit theaters on April 13, 2018. Be sure to stay tuned to Paste for updates on Fox’s ever-growing X-Men film slate.